The countdown to Toasty’s arrival is totally on. I have a list of things I want to make before he gets here but at the very top is a Moby baby wrap. I still have my pouch sling that I used when L was little and I would watch her while my sister was working but the Moby carrier is a nice different option. 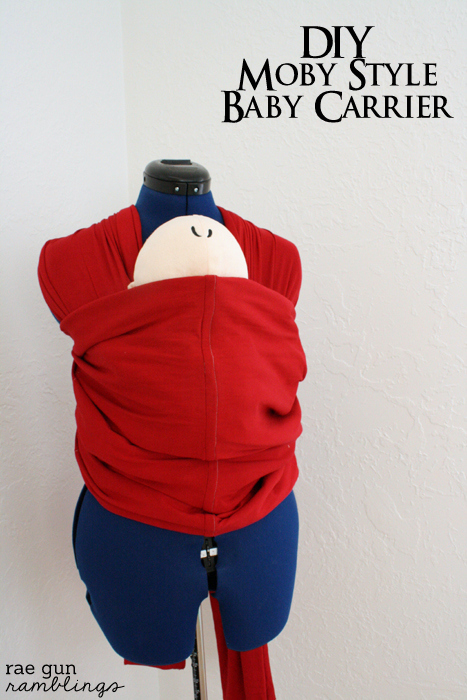 While registering I was shocked at how expensive these carriers are so today I want to show how to make a moby wrap baby carrier. Even if you can only sew a straight line you can do this. As far as sewing skill level goes this has to be one of the simplest tutorials I will every share on this site. And it’s so easy and quick that if you can’t sew a stitch you could cut it out and take it to a friend who sews and have it done in 5 minutes. Or if you want you can buy twice as much fabric and you wouldn’t have to do any sewing (you would have a lot of fabric left over or you could make two). 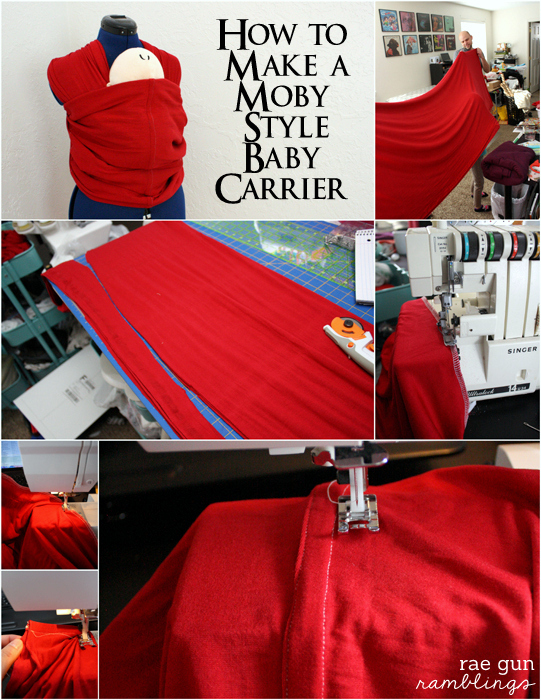 The moby carrier is pretty much one long strip of fabric that is tapered at both ends. You can see the measurements above. The key is really just cutting it. 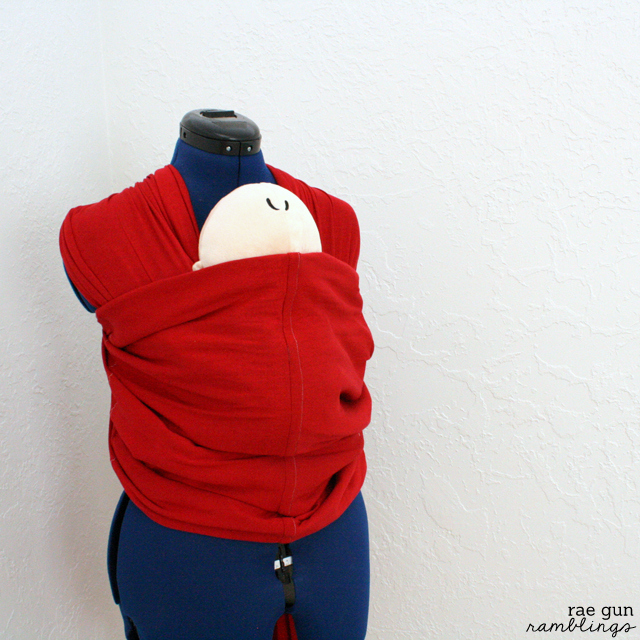 I like the sewn way because it saves money and it gives you a seam down the middle which is handy way to find the center when you go to wear the baby carrier. If you go for the no sew way you basically cut your fabric in half and fold it instead of having the seam shown in the picture (this might make more sense after my instructions below). Start with 3 yards of 2 way stretch knit fabric. Get something of decent quality not too thin so you can see through it. I like the stuff Jo-Ann Fabrics carries. Have a helper hold the other end and cut the fabric in half lengthwise. This should leave you with two pieces around 30 inches by 3 yards. Don’t worry about it being exact if your fabric is a little bigger or smaller in either direction. Then with right sides together sew or serge the ends of the two pieces together. You should now have a long strip 30 inches by about 6 yards long. Make a french seam by folding the ends to sandwich the tails of the seam into the sides. Sew down encasing the wrong side of the seam. This will leave you with a little flap. Now open up your fabric and lay the flat to one side and sew down the flap so it lays flat. Now you are good to go. Since it’s knit it won’t unravel. 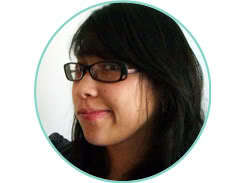 My niece T (the older one) pretty much lived in the Moby. I remember my sister walking her to sleep and then laying down and carefully unwrapping her to sleep on the bed. Can you say needy? But really this is so convenient to keep your little one close and your hands free. If you want to run to the store I recommend putting the wrap on at home so you don’t have to worry about the tails dragging on the dirty parking lot or store floor. And driving with it on then when you get out of the car pop your baby in and you’re good to go and don’t have to juggle the car seat. 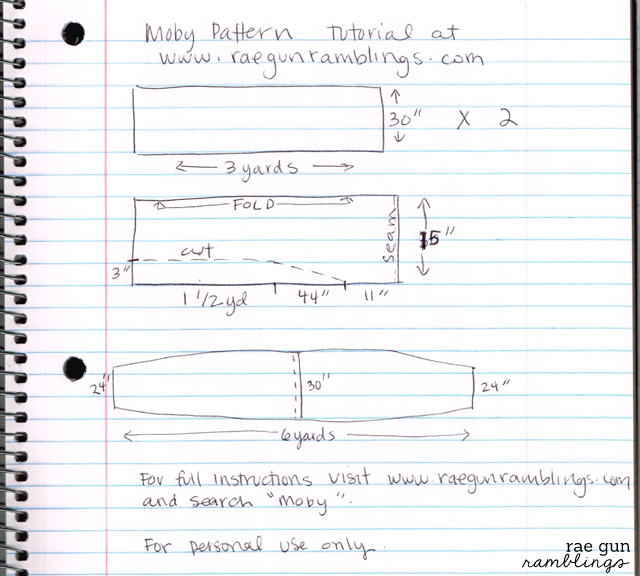 I think the best way to learn how to use the Moby is to watch a video. Once you see it on a real person it makes so much more sense. You can use these for newborn as well as toddlers. This video shows 3 carry styles but if you go to YouTube you’ll find a bunch of other ways. Just remember to always be careful and use your best judgement (some of those carrying vids seem a bit crazy in my opinion). And check back in tomorrow. 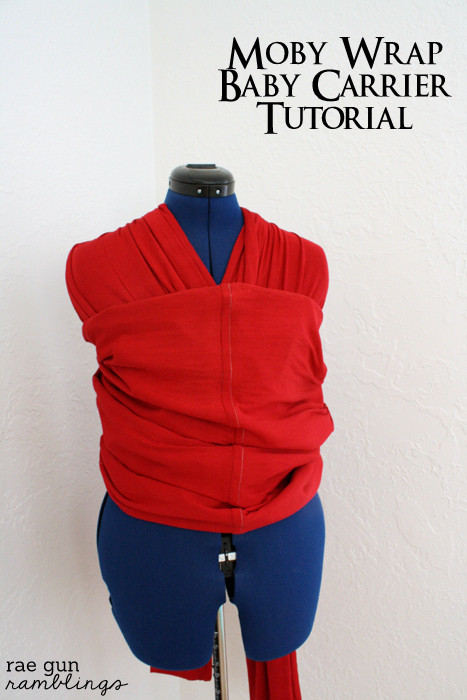 I’m showing how to make a Moby wrap with a decorative panel. This is awesome! If I ever have more babies I would love one of these! Pinning! This is amazing! I am not pregnant, but hopefully in a few years I will be, and I will definitely use your tutorial! Sometimes I want to have more babies just so I can use all these awesome products out now. The carriers I used were not as cute or convenient as this one. Great job as always! Moby Warps are awesome!! Hoping to have another someday soon so I can use this tutorial. Thanks for sharing!! A friend made me a wrap like this, and it was indispensable. 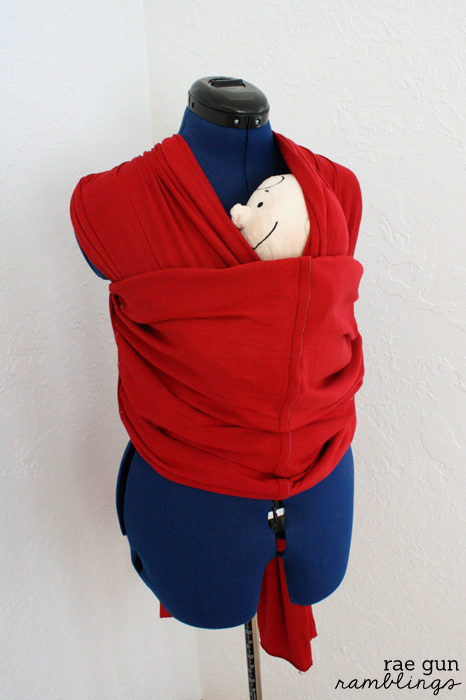 It’s super nice for going on walks or outings as well, and snuggles your little one in for more shared body-warmth on cold days. Mine doesn’t have a seam in the middle, so I hand sewed a little ribbon on the edge so I could find the middle easier — for a sewing-phobic, you could also iron-on a patch or draw a little design with fabric markers. But it really does save time to be able to find the middle quickly! Perfect timing! I was just thinking that I wanted one of these! yay I love hearing that! Such a great tutorial! I have always wanted one, but didn’t want to shell out the cash. If I have another baby, I will be making one! Thanks! Sure wish I would have had one of these 10 years ago. :) I’ll be sure to show this to my sisters. I loved my moby! Kind of a pain to get used to, but so perfect once you get the hang of it! Definitely a learning curve but well worth the function! Awesome! I loved my Moby (though I never learned how to wear it very well!) So great to know how to make one; those babies are pricey! You are going to LOVE this! My husband and I both love our wrap carrier and have used it with both our kids. I have a sling too, but my husband isn’t comfy in that like he is with the wrap. Love that you DIYd this. I’m working on a post draft right now about newborns and wrap carriers and will definitely include a link to this post for all my crafty readers. I just want to check that I’m understanding correctly – this assumes a fabric width of about 60 inches? Thanks!